‘Sunset Series’, painting the impossible takes a little longer. By Gordon Frickers, a landscape painting measuring 47 x 62 cm (18,5″ x 24,5″), oils, available,available, £2,000 ~ a bargain, an investment for you, one of my all time finest paintings. ex studio, ex frame. One of the ‘Sunset Project’. 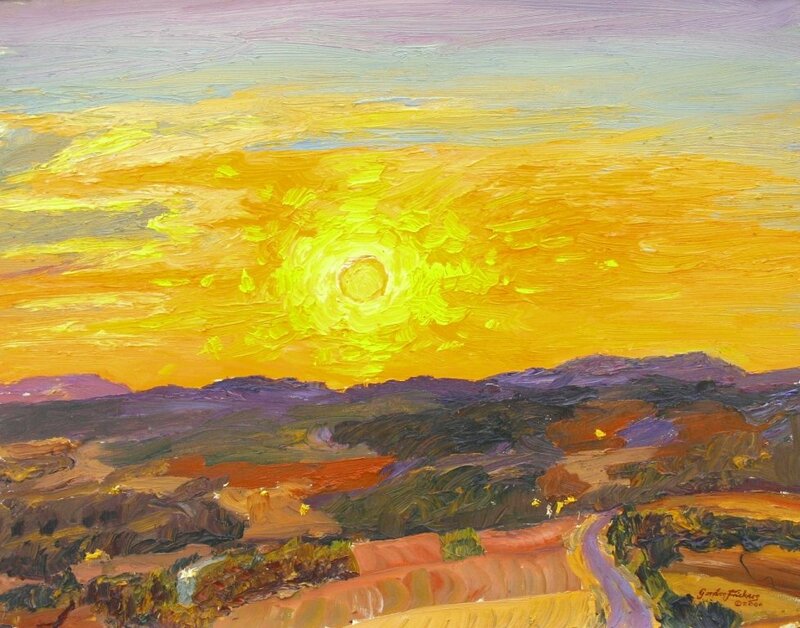 A scene, worthy of an attempt, ‘Impossible to paint‘ was my reaction to these particularly vivid sunsets seen during an unusually hot spell, daytime temperatures reaching 45 to 48 C (up to 118.4 F) , at Castelnau de Montmiral. ‘Sunset Series’, painting the impossible… these landscape paintings came about almost by accident or was it inspiration? They were of course pre planned, with careful preparation, painting the impossible, ‘Solar Power Painting‘! Ancient Egyptians sometimes painted a sun disc guarded, before and behind, by a lion. There it is – the rising and setting sun, your day, held between past and future. ‘Solar Power Painting‘ ~ Francis Pratt of the Painting School of Montmiral had been urging me to let my painting go into free fall, « try power painting » he said. Fine, so here is ‘Solar Power Painting’. I also thought it would be unlikely anyone would like the results. Of course that thought lead to ‘I’ll try and see what happens‘. The site I chose to work from was the mound of the Virgin at castelnau de montmiral so the forest you see on the skyline is the Foret de Grisigne, according to local people one of the two oldest unspolit forests in Europe and a greast source of many natural renewable products some of which in various forms including soaps and prefumes are available via the village pharmacy.